Photos of the Heathered Black Live Natural crop showing the gather details at the back of the waist and bottom cuff. I tried these on yesterday and was lucky enough to snag a last pair of the ombre ones. However, I also liked the heathered black and if money were no object I would have gotten them, too. The cotton is soft, thick, and opaque. If you are an old time lululemon fan then you remember their OQOQO line of cotton items and the Live Natural crops remind me of the items in that line. I think they are a fantastic piece. I plan to use these more for casual wear but I've read reviews of people being happy with the performance of these in the gym. I thought the fit was very similar to Wunder Unders and TTS. 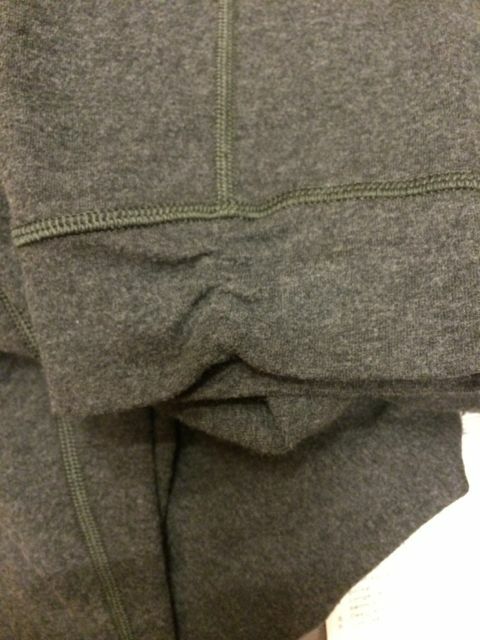 Close up of the waistband of the Live Natural pant. I didn't find the waist on the Live Natural Pant nearly as comfortable, nor as cute looking, as the crop. The fabric was the same as in the crop, soft and opaque. Hi Low Shine Tight, shown with a Mountain Tank and Free to Be bra. I ended up getting a Mountain Tank yesterday in the Heathered Black. I was in a total comfy clothes mode yesterday but I do love the two Vitasea Every Yogi tanks I have. I really like the longer, rear-covering length and loose fit on this tank. I definitely would love another one. 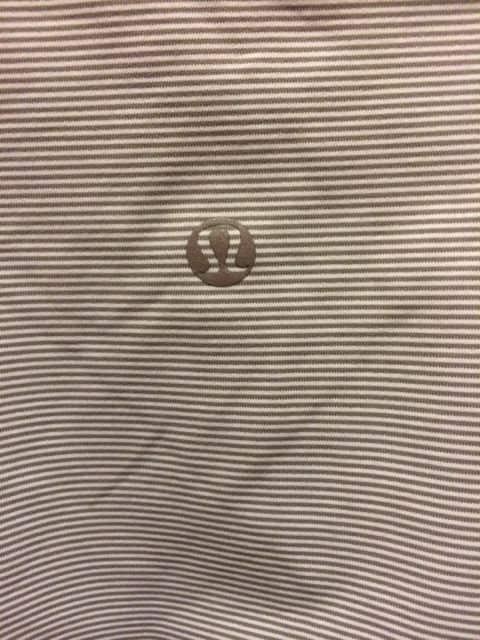 One thing I would love to see is lululemon bring back the prints in the Every Yogi/Vitasea tops. I did end up sizing down in the tank but I was really torn as to get my regular size, too, since I really liked the flowy feel and look. From the comments I have seen the people who like this tank really like it and get more than one. I plan to use this for casual wear rather than the gym and think it will be fantastic for the summer. I tried on the Cozy Crop top and really liked the style and brushed luxtreme material (love this material - so great for cutting the wind!). If it were a full length shirt I'd be all over it. It's a nice piece but not really practical for me at the price, though you could wear it layered over a CRB. I found the sizing a snug TTS. 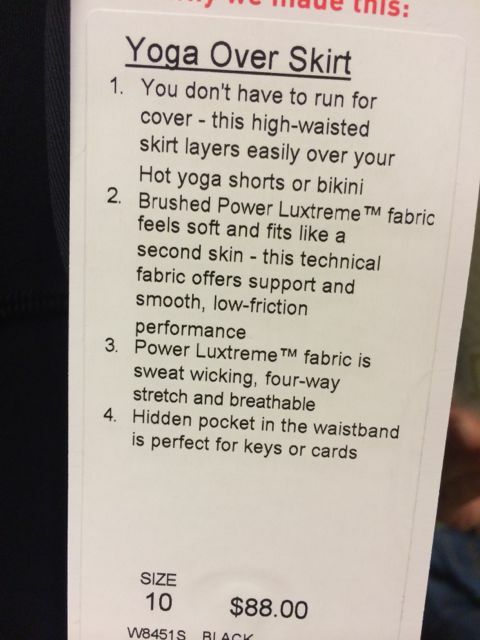 I also tried on the Yoga Over skirt and liked that, too, though I would need to wear it with spanx to smooth everything out underneath it. I found it TTS. I tried on the 1/8 Stripe Cadet Cut the Crops, too. I didn't really love these - they were just ok - and found the material rather sheer in a bend. I thought the fit was TTS. I also tried on the Run Righteous tank and found it a clingy TTS. I think for running I'd probably size up in it. I personally don't really care for the big cuts in the back but it's an ok shirt. 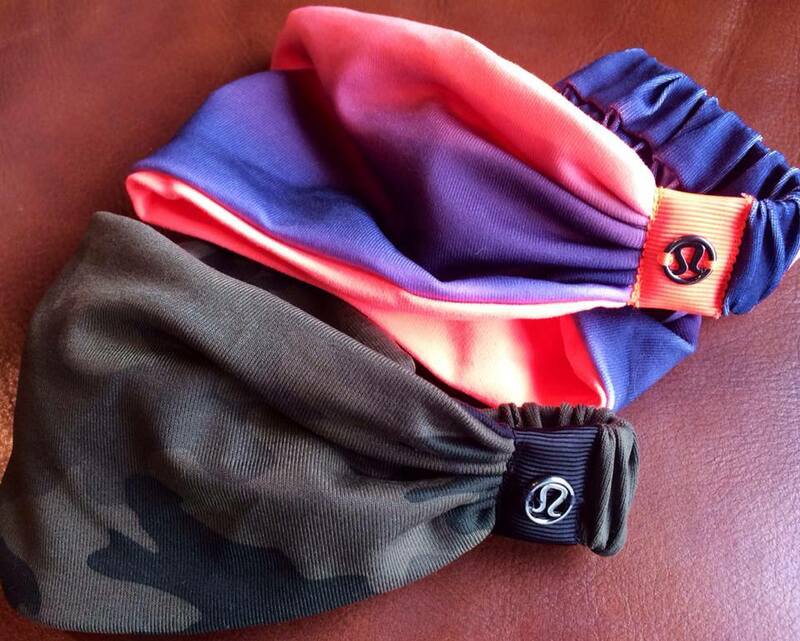 The new camouflage and Beachscape Multi bangbuster headbands. There is a lot of variation in both prints and you'll have to cherry pick. Thanks LLA for your review. I just received the floral platoon silver spoon wunder under crops today and I LOVE. They are thick, opaque and run TTS. I also got my beachscape groovy shorts. I thought the inseam was a little shorter than my other ones but I don't care, they're awesome. I bought the ombre live natural crops earlier this week. They weren't even on my radar, though I had noticed they sold out quickly online. I tried them on and had to buy them! I agree with your review of the Cut the Crops. They were very shiny and sheer. I thought they ran smaller than most luxtreme crops. It seemed like a failed attempt to get a compressive feeling. They also felt like they were falling down due to the low rise. Not a good fit at all. Can't wait for the beachscape print to hit my store! I am not a camo girl at all, but I do love the beachscape. Love the fit reviews, by the way!! Love the fit reviews LLA! I like the gather detail on the Live natural crops - may have to try them on (if there are any left in store) tomorrow. I was kind of liking the ombre, but was unsure on the sheerness of the material. Also appreciate the price points of items. 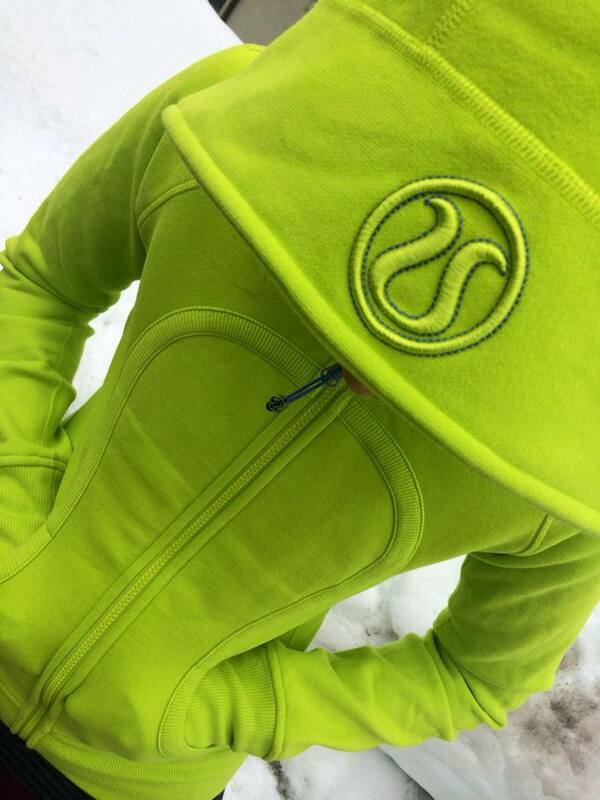 Has anyone tried the post sweat pullover?! If so, is it TTS or size up if you have broad shoulders? I have been eyeing the heathered cadet blue ever since the upload, but I wanted to wait until I could get to a store to try it on. Unfortunately, I'm afraid they are going to be sold out by the time I can make the drive :/ TIA! Thanks for the fit reviews by the way, LLA!! I always look to your blog before I make purchases. You are the best! Ombré crop w mountain top--can you say "backfat". 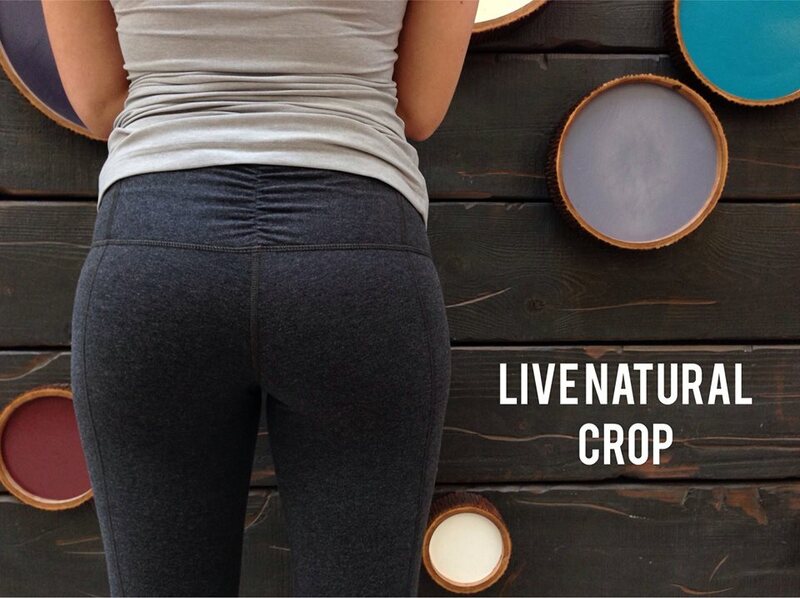 I absolutely love the ombre live natural crops! I picked them up at the store an hour after getting their PN and got the last one in my size. I'm loving the new scubas in the photos, hoping to see them in person tomorrow at Lulu. 1. 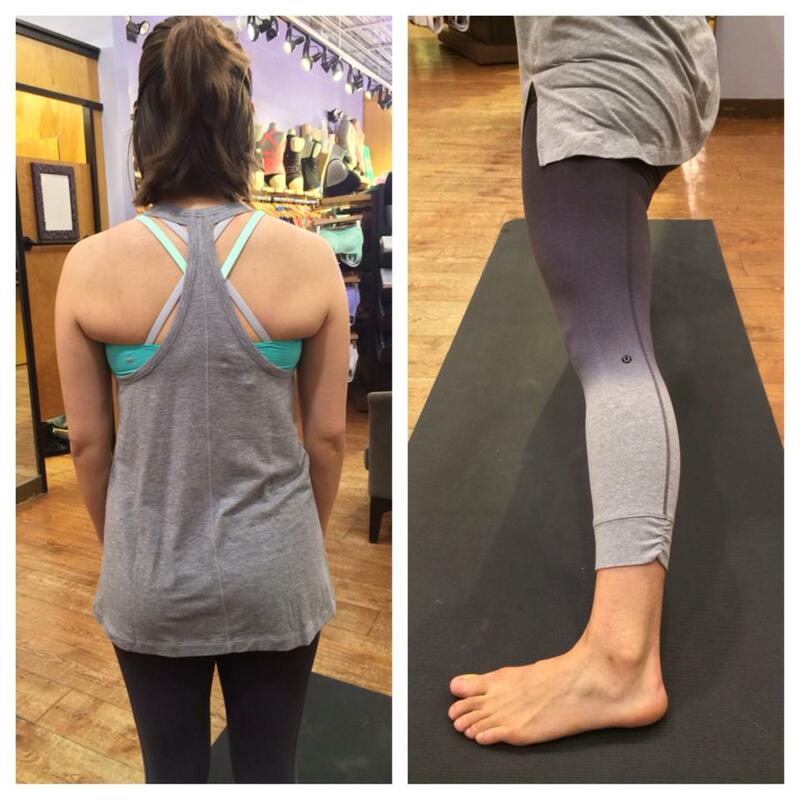 Are the Pace Queen tights the same length as the Pace tights released last year? Oh I love Oqoqo. So sad they closeed up shop. I would get the size up. I tried on a size up, and it felt right. Just enough room. For reference, I am a 4 in everything except the swiftly LS, which I like in a 6. This top was a little more fitted, like the base runner. Personally I was more comfortable sizing up, especially if you want the shoulders to be wider. 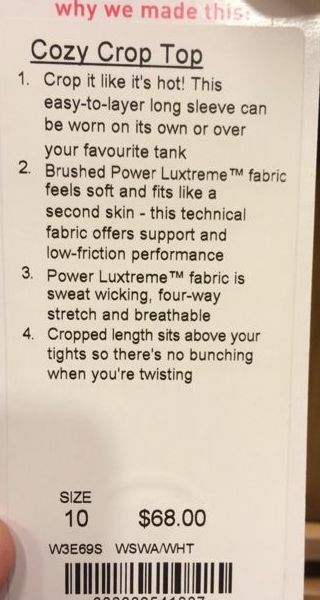 I bought the cut the crops but interestingly enough -- I am always a 6 and sometimes a 4 but sized up to 8 because I was worried that they were too compressive in the waist area in 6 (and they are able to be tightened) -- that eliminated some of the shininess and sheerness. 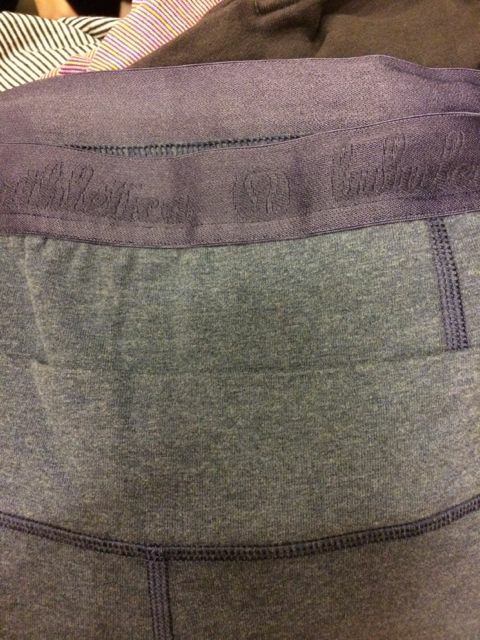 I also tried on the roll down wunder under pants -- ran a bit large -- I tried a 6 and very comfy -- but I thought a bit too casual except for the gym. I bought the Live Natural pants in Heathered Cadet Blue and absolutely love them. I find they fit high around the tummy and help to hold everything in, while still being super soft and comfy. They are thick and opaque and I love the color. I'd buy a 2nd pair in Heathered Black if they came out. 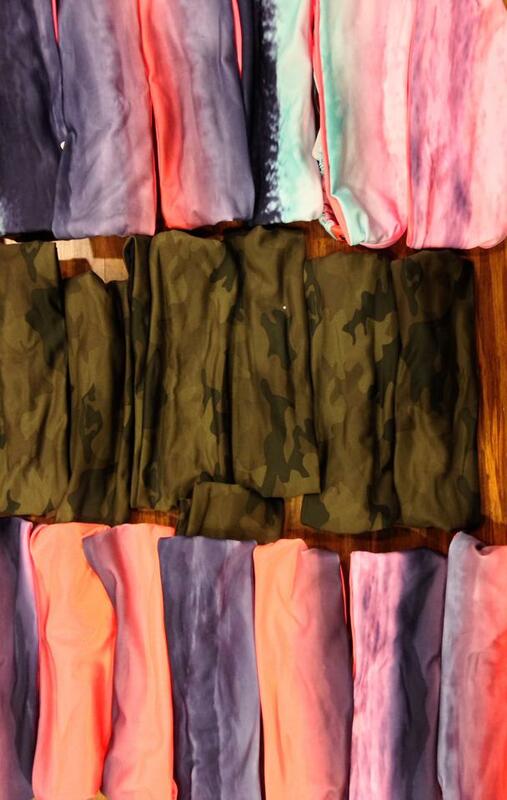 I would also like to get my hands on some ombre crops. Thanks for the reviews!! I also always stop at your blog first on upload days to see what's hot and what's not! OT - has anyone tried on the cadet blue inspires yet? Are they sheer?? I love that Bordeaux color in the Scuba, but I don't want another hoodie. 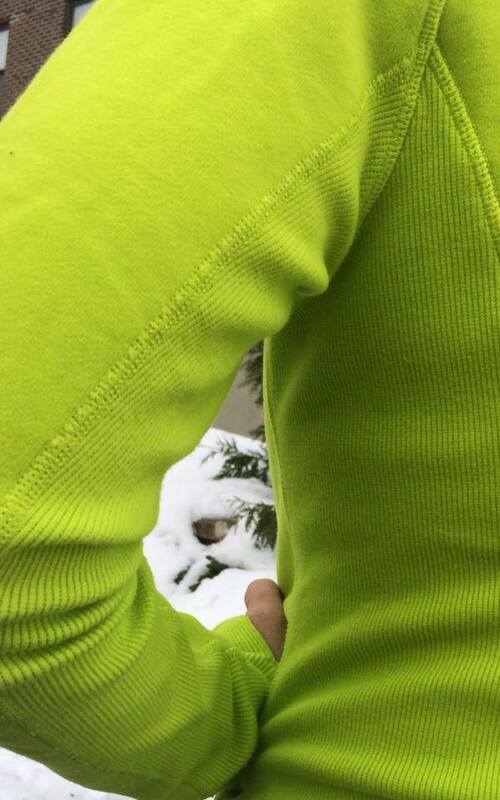 Any rumors of that color coming in something else? whens shine tight coming or has it already came out in canada and US? Where have the shine tights been spotted? I must have them!! I got the mountain tank in cadet stripe but am debating return. I love the loose body and back of the tank, but I am not sure it is the most flattering cut for me. Does the yoga skirt come in a size 2 this year? @anon7:07, it's the new sizing of the newer colors of the energy bras. Everyone I've seen in them has back fat, even when they don't normally have it. I haven't purchased one since the plum ones came out last year. I try and try but my regular size 8 looks awful and the 10 swims on me. I'm a size 6 in all other LLL but size up for the bras to avoid back fat. I've moved on to the all sport bra because it fits so much better. @ anon 9:09 pm - No, they were uploaded the week before and sold out super fast. 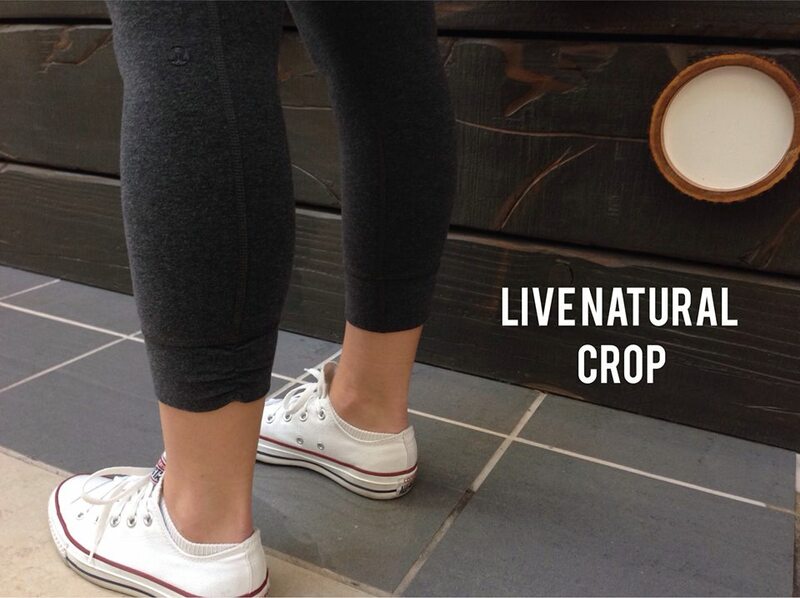 Did the live natural crops come in size 2? any fit reviews of the cade blue inspires? I tried on the hyper stripe black/soot/pink ones at a store and they were shiny and thin. They did not have the mesh behind the legs, so they might have been good for cooler weather runs, but I thought they seemed sheer standing up, even in the poorly lit dressing room. I bought the cadet blue inspires today. Found them to be the right amount of compression. Opaque in my TTS 6 (5'6" 125 lbs). I really like the cadet blue trim...subtle. I really like my cut the crops in cadet blue 1/8 stripe. I'm not a fan of the side detail fabric, but it's not that big a deal to me. These have ended up being my go to crop since I purchased a few weeks ago. Need to give my other one zillion pairs of crops/pants a fair shake. The Pace Queen Tight in the same stripe looked so promising until I saw the black funky fabric at the ankle. The cadet blue color of the same fabric on the Cut The Crop is not so glaringly "we went a little too far with this fabric" as the black. Cadet blue inspires felt really thin, very little compression. Didn't pass the bend test for me. To be honest though, ALL inspires are incredibly thin now. I tried and bought it. I didn't find it sheer at all. 7:23 and 7:35: I saw the shiny tights yesterday in Toronto's Yorkdale mall. I'm not interested in them, so I didn't investigate any further, but they still had all sizes. I tried the skirt & crop top today. Both were just ok - not loving it enough to purchase. The wee stripe/ black one was as LLA predicted - see through. Over a bathing suit it would NOT look good because you would see every bump! The crop top was nice but really couldn't see any practical use for it other than pairing it with the skirt. Both were true to size. 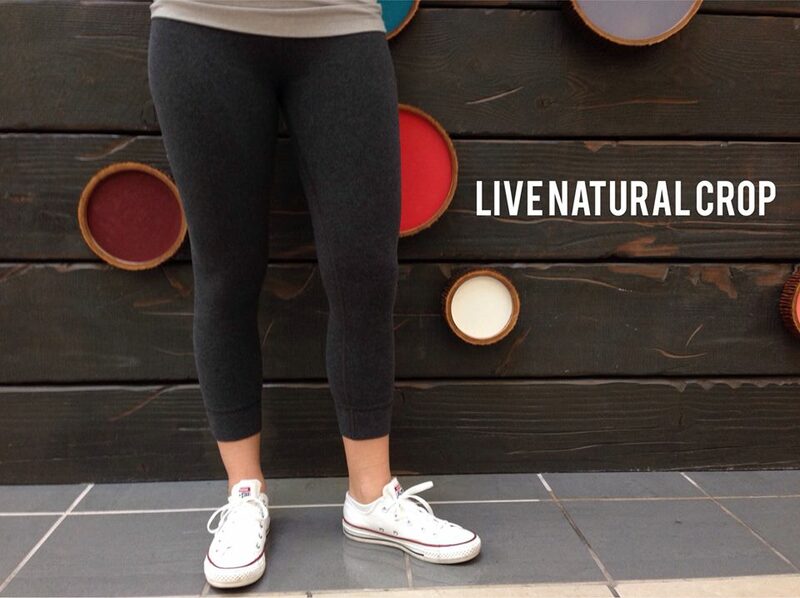 Has anyone seen the live natural crop in ombré at any of the toronto lululemon locations ? Any one have The Mat? I have the travel Manduka mat and it's great but not enough padding. Loving the new colors in The Mat, so would love any feedback from you lovely ladies / gents! Thanks! This is very helpful. I do need the shoulders to be wider, so I think I'll size up. this is completely random but this is for all you dog runners out there. Recently started running with my pooch but its quite gross outside and ive been looking at getting him a functional jacket that gives him room to run. Anyone have any recommendations? Just bought the bordeaux drama scuba. Love the beautiful pattern, soft fabric, and the fit with the side panels. It is longer and slimmer than the old version. I am between 4 and 6 and need to take size 6, like in the forme jacket. I have not cut the tag off yet since I don't love the big log on the hood, but at least it is silver not white. sorry but the live natural crops fit nothing like WUs when it comes to the waist, the live naturals are noticeably low rise. wanted to like them but I can't stand low rise pants. anon @ 8:28, almost positive the skirt does not come in a 2. I have The Mat from quite a few years ago now, it's really nice and thick, I have old knee injuries that I'm a bit tentative with every now and again and I find the padding is really good for that, but it's not squashy padding, it's quite firm so holds very well on the ground in poses like warrior. It holds up well, even against my cat that's found it a few times and tried it out as a scratching post. On another note why in Gods name would you make a crop top in a brushed fabric, it seems like one of the biggest ever exercises in futility to me. Were the live natural crops uploaded already? I don't remember seeing them. Thanks so much for this blog! 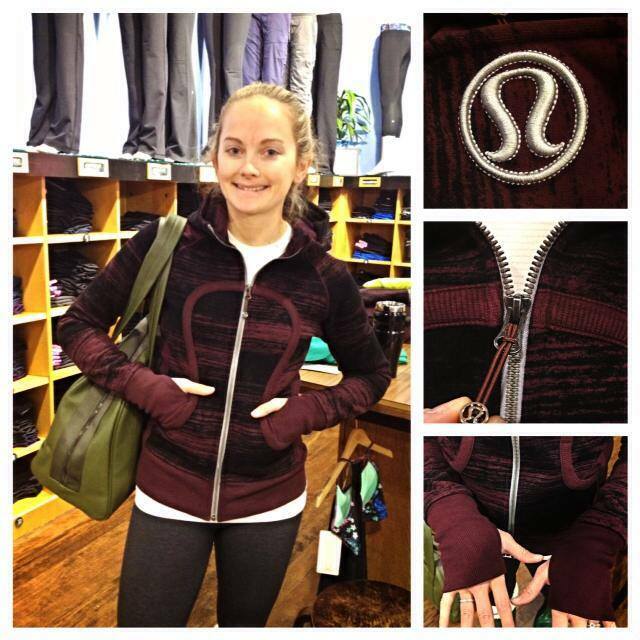 Really helps to navigate the lululemon world I'm fairly new to. One question, how do you know if a product will be made again or if it's a one season/ one time thing? I'm just kicking myself for missing out on the street to studio pant in fatigue. Do you think they'll come out with more colors or do they ever restock? Thanks so much! @6:12 I have the mat. I love it. It's really thick and holds up very well over time. The only bad thing is when it first arrives it has a terrible plastic smell. I had to air it out for a week before I could use it because the smell was so bad. Just saw patterned black wunder unders uploaded-the ones with a design on the side. I didn't see them as part of the original upload, so maybe uploaded in their own. @ anon 8:51 - re the fit of the new scuba II. I used to be a 6 in the original side panel scubas pre Fall 2012. Then I went up to a size 8 in the scuba stretch with lined hood. I just bought the bordeaux scuba II in size 8. The 6 was too tight. I had expected to be a 6, especially since the calm & cozy that came out at Christmas had side panels and in a size 6 was very roomy. This was not the case with the bordeaux scuba II. @ Lauren F. I sized up one size in the Post sweat PO. I have heard the same from an educator and one friend. I purchased the mountain tank, love for summer! Sized down and it was still flowy :) now we just need some nice weather so I can wear it!! @ anon 9:58 am - I meant more that the fit through the legs reminded me of how Wunder Unders fit though I didn't notice a big different through the waist. I'll have to overlay and compare the rise of the WU to the Live Naturals. To Anon 2:25. I have found great jackets for my dog by Ruff Wear. They cover the underside of their belly pretty well, but I haven't found anything to keep his legs from getting so dirty!